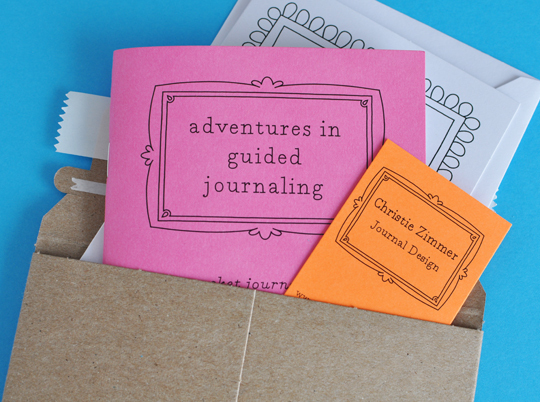 Adventures in Guided Journaling: It's Up! 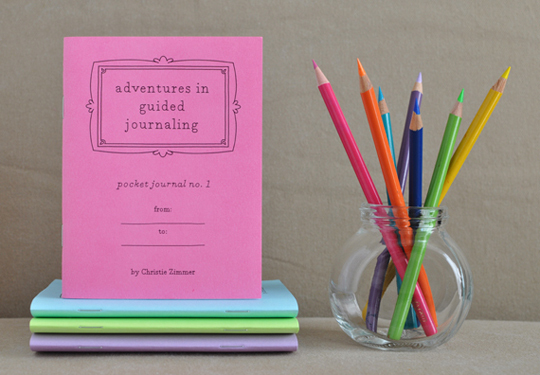 After much further ado, I have finally listed Adventures in Guided Journaling: Pocket Journal no. 1 in the shop. This comes after no small amount of worrying fretting careful consideration about how to photograph it, how to describe it, how to price it, how to package it, how to send it, how to make sure I get everything perfectly right the first time out (which may, in fact, be impossible), and how to anticipate every possible unknowable glitch (which may also be impossible, but about which I have also spent a considerable amount of time fretting thinking). You know, the usual. For me. Here it is in pink with the other choices also pictured. In the shop, blue, green, and purple are each given their proper due and are listed separately. One thing I haven't mentioned yet is the size of my pocket journal, other than to say that it is pocket-sized. Which, given the variety of sizes of today's pockets, is definitely open to interpretation. This pocket journal is 4.25"x5.5". About a quarter of the size of a sheet of letter paper. And finally, this is one of my mailing envelopes, which will give you a sense of what a single order might look like. 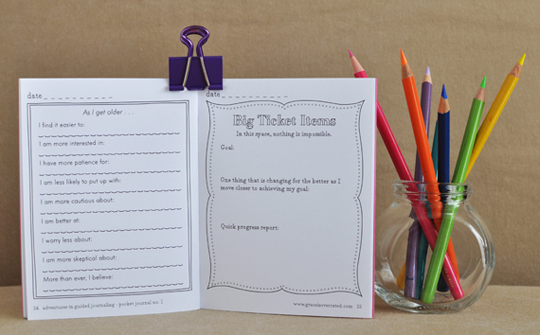 I'll be including a pocket journal, of course, and one of my business cards. Oh, and that note card and envelope sticking out from behind? Well that's a little extra I've created to include with each package. It's a little something dedicated to friendship. 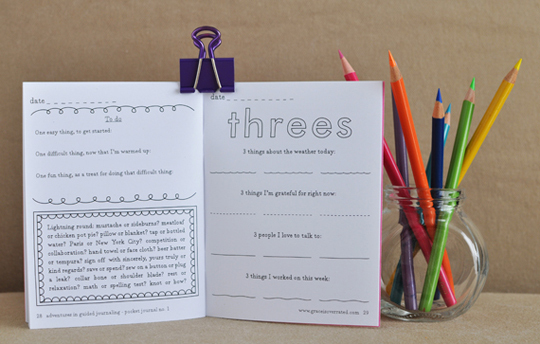 Something you can fill in, colour, and pass along to a happy recipient -- and it isn't available anywhere else. Hi Jo! Thanks so much!! Soooo excited that you are "doing this thing"! Just placed my order, can't wait to see it! Hi Beth! Thanks so much!! Woo hoo! Just ordered mine -- can't wait! :) Congrats! Hi Hungry Crafter! Thanks so much!! Hi Rhonda! Thanks so much!! Oh I can't wait. I want them for all my grand daughters. But I will have to wait just a bit. These are so adorable. Hi Paula! Thanks so much for your lovely comment! Hi Silverlotus! Thanks so much!! these are so cute! are they different than the 52 "pages" you have available, or is there some overlap? thanks for the info! Yay!!! The photos look great! You can tell you put a lot of thought into it. Congratulations!! Hi Soyprincesa2! Thanks so much!! Hi Scribbler! Thanks so much!! I just pinned this to my, "Now that's SNAZZY" board on Pinterest. I am going to buy this for myself as an "I've made it through another school year" gift. Thanks for sharing your creativity!! Hi Becky! Congrats on making it through the year and thanks so much for stopping by! I would love one of your journals, please let me know how to obtain one!